For a discussion on the Yangzhou school and its production of wares for the Court, see the footnote to lot 690. 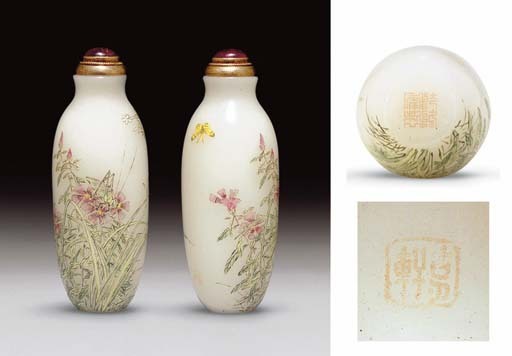 The subject is known on classic Yangzhou glass overlay bottles of the mid-Qing period, and the painterly style and genre scenes are typical of the town. See H. Moss, "Mysteries of the Ancient Moon", JICSBS, Spring 2006, where the group attributed to Yangzhou is discussed on pp. 31 and 32 with several illustrated examples. The style of painting is quite different from most of the court wares, and the enamels were used in a thinner, more painterly manner than most of their Beijing counterparts. When the Qianlong reign mark was used at Yangzhou it was always a four-character, seal-script version, usually written in a single, horizontal line although some are four-square. What is extremely rare is to find the Qianlong mark used in combination with the Guyue Xuan mark which is incorporated here into the painting. The use of both names may indicate that the artist was aware that he was producing one of the rarest forms, and finest paintings of the entire school.